1 Drain, rinse and dry grape leaves. 2 Place off to the side. 3 In a large bowl mix ground round, Lamb, salt, pepper, minced parsley, onion chopped, crushed or pressed garlic and Tabuli (or rice); mix well. 4 Lay out one grape leaf stem up, place about 1 rounded tablespoon meat mixture near stem. 5 Fold stem up over meat mixture fold one side leaf over mixture, fold top over then roll the rest but not tight. 6 This is just like making a burrito. 7 I use toothpicks to keep the stuffed leaves together. 8 Place in at least 1 gal pot. 9 Continue until all leaves are filled and snug in pot. 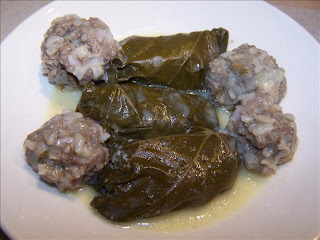 10 If you run out of grape leaves that's okay, you can roll little balls of meat mixture and place in pot. 11 Cover all stuffed leaves with chicken broth adding water if you don’t have enough broth, more broth if you have it on hand (you can use just water if you want). 12 Bring the broth to a boil then turn heat to low, simmer and cook covered until tender (pierced with a fork) about 30 minutes. 13 Remove about 1 quart of broth from pot and let cool down a little. 14 You want it hot just not scalding hot. 15 In another bowl beat 4 eggs until frothy adding slowly juice from lemon. 16 Take the warmed broth and add to the egg mixture slowly a 1/2 ladle at a time still beating the egg mixture. 17 After all broth is mixed with egg & lemon slowly add to pot on stove. 18 Cover the pot and turn flame off. 19 Let sit for about 10 minutes then serve. 20 I like it tart and rich so I use more eggs and lemon then the recipe calls for. 21 You can experiment how many eggs and lemon you want for the egg lemon broth. 22 Leftover broth in pot makes good Avgolemono (Egg Lemon soup). Tomorrow would have been – should have been – my dad’s 60th birthday. You may remember that last year on his birthday, I shared with you his very favorite cake, the one he would always request for his birthday. 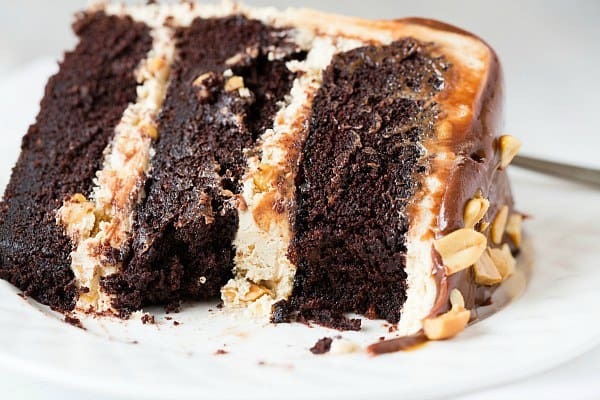 It’s a fabulous cake – a moist, chocolate cake with a river of cheesecake running through the middle and topped with sugared walnuts. It’s a very worthy birthday cake. However, if he were still here, I would have insisted on making something different and more elaborate than the cake he requested every year since it would be the big 6-0. I have no doubt that he would have been completely smitten with this cake and found every excuse in the world to eat piece after piece. When we were kids, my dad apparently got some routine blood work done that showed his cholesterol as borderline high. My mom banished sweets from the house (my dad was an ice cream fanatic) and started whipping up homemade banana-nut oat bran muffins. The only problem? He went to work for eight hours a day. My dad worked for a small company not far from where we lived, so sometimes if we were out, my mom would stop by for a visit. One day we walked into his office and my sister and I saw tons of candy bar wrappers in his garbage can. Apparently, my dad was a big Snickers fan. You know little kids love to tattle… especiallyif they get to tattle on their parents. It took all of two seconds for my sister and I to let my mom in on our discovery. We totally busted my dad for sneaking candy at work while my mom was making batch-after-batch of bran muffins. Sorry Dad! I’ve had the idea for this cake bouncing around in my head since last summer, but remembering that moment of finding those candy bar wrappers, I knew I wanted to save the recipe to commemorate my dad’s birthday. I’m so glad that I did – it’s definitely a special occasion cake that he would have absolutely appreciated. 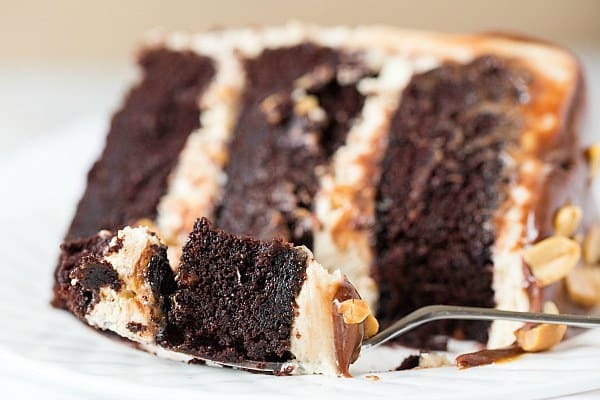 I started with the chocolate cake that I used for the six-layer chocolate cake with toasted marshmallow filling and malted chocolate frosting, only left it at three layers instead of dividing it into six. 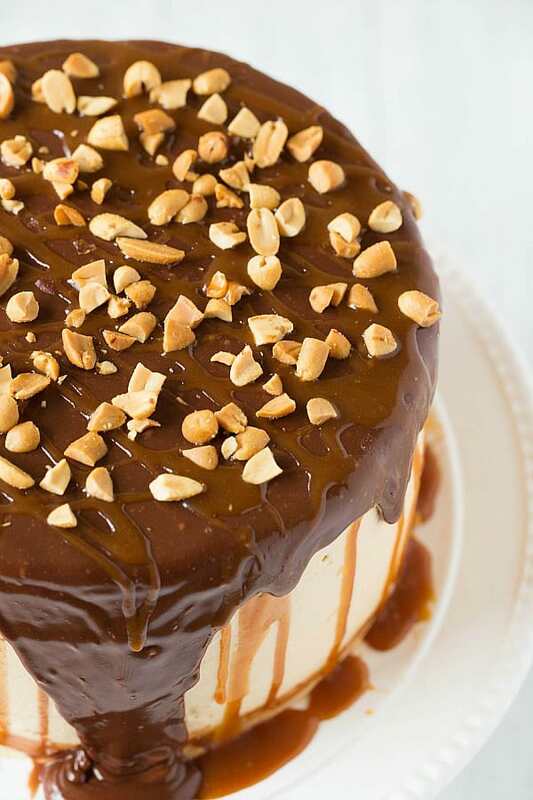 For the filling, I used the peanut nougat from the homemade Snickers bar recipe, along with a smear of salted caramel sauce. 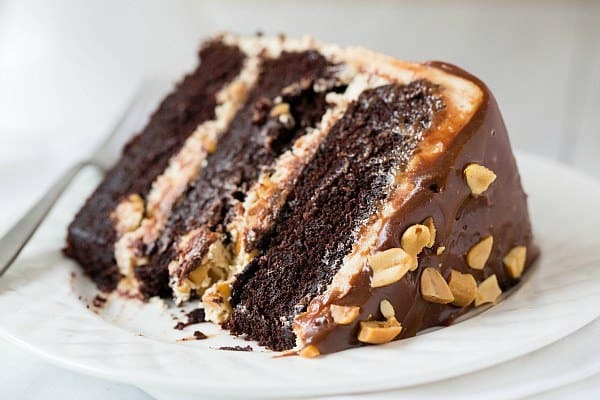 I then frosted the whole cake with a thin layer of salted caramel buttercream and topped it with a milk chocolate ganache and chopped peanuts. That’s a mouthful! Like I said, I totally delved into “special occasion” cake territory here, and it might be one of the best cakes that I’ve ever made. It truly tastes just like a Snickers bar. If I had to guess, it’s the nougat filling that totally makes it. As is always the case, commemorating the birthday of someone who is no longer with us is bittersweet. I love to think about the time we shared, but of course wish that he were still here. It’s been a little over 14 years since he passed away and I was only a week past my 18th birthday when it happened. As I get closer to having spent just as much of my life without him as I did with him, it’s a strange feeling, but I continue to relish all of the wonderful memories of the time I did get to share with him. This cake is a celebration of that time, and of him. 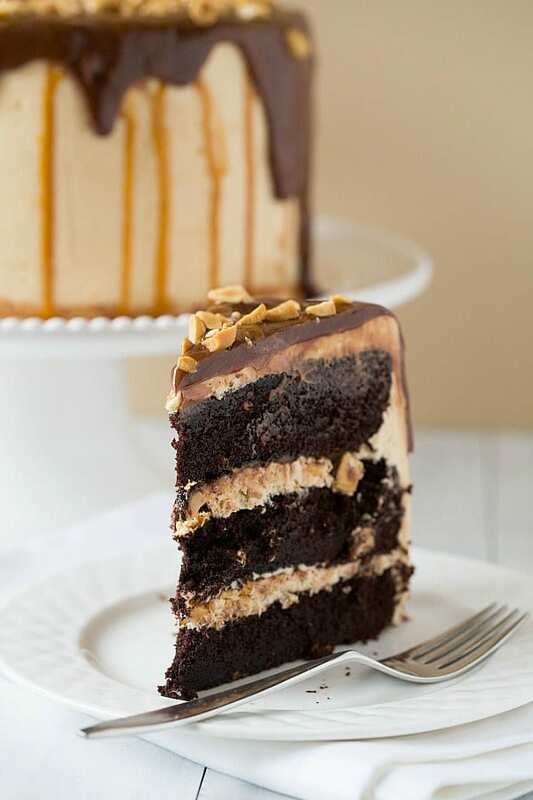 A cake reminiscent of a Snickers bar - chocolate cake with a peanut nougat filling, covered in a salted caramel buttercream and topped with a milk chocolate ganache and chopped peanuts. 2. In the bowl of an electric mixer (or large mixing bowl if you're using a hand mixer), sift together the flour, sugar, cocoa powder, baking soda, baking powder and salt. In a medium bowl, whisk together the eggs, buttermilk, coffee, oil and vanilla. 6. Make the Frosting: Beat together the butter and cream cheese on medium-high speed for 5 minutes (I like to use the whisk attachment for my KitchenAid stand mixer, but it's not necessary). Pour in the salted caramel and beat until combined. Reduce the speed to medium-low and slowly add the powdered sugar, a little at a time, until it has all been incorporated. Increase the speed to medium-high and beat for an additional two to three minutes, until light and fluffy. 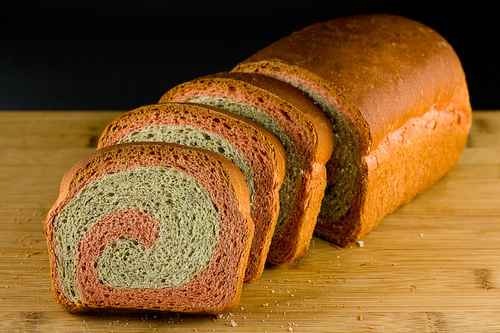 Green tea and red rice add more than color and an East Asian twist to this soft bread loaf. Lightly enriched with sugar, butter, and an egg yolk, the subtle tastes of both ingredients pull through along with their many nutritional benefits. The health benefits of green tea are well-documented, but red rice may be a bit unusual depending on your location. It is mainly used as a natural coloring agent in Chinese cuisine and as a dietary supplement known tocontrol cholesterol. I consider this bread a tasty way to recover from sugarand chocolate eating sprees. I meant to join Boaz’s Bread Baking Day for colorful breads but it got buried under a ton of unfinished posts. All three of them. I’m blaming all that sugarI’ve been having lately. red rice pastes until a shaggy ball of dough is formed. incorporated, about 5 to 6 minutes. illustrated in this recipe for Frisian sugar bread. loaf halfway through baking if necessary. Green tea and red rice swirl bread crust. You are relaxed. You are getting very relaxed. If you’re making your own dulce de leche from sweetened condensed milk, this recipe uses exactly one 14-ounce / 396-gram can. Make dulce de leche from scratch, or by heating up sweetened condensed milk in its own can or in a bain-marie. 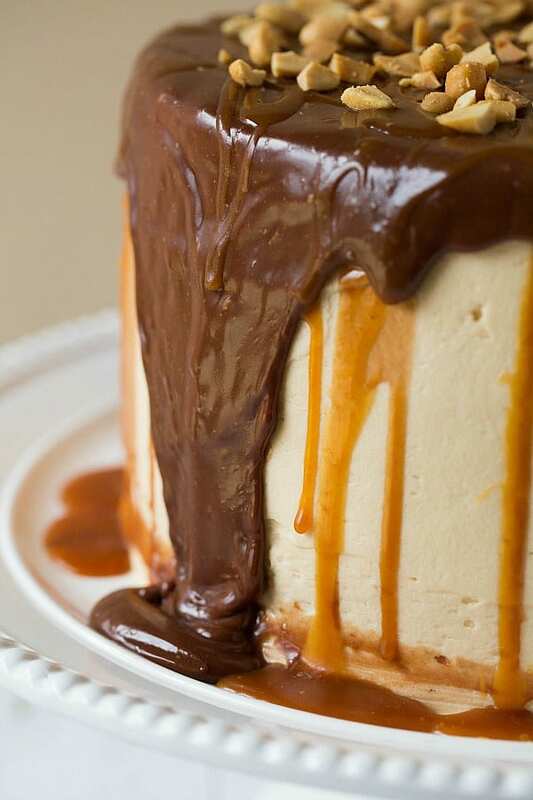 In a heavy saucepan, heat the milk and dulce de leche just to a boil, stirring until the dulce de leche is dissolved. Remove from the heat and add the heavy cream, vanilla extract, and salt. Cool completely at room temperature. Store in an airtight container and refrigerate until thoroughly chilled, preferably overnight. Serve immediately for a soft-serve consistency or store in an airtight container and freeze.